is a board certified Maternal-Fetal Medicine specialist and a fellow of the American College of Obstetrics and Gynecology. He received his BA and MD degree from Columbia University in New York and completed his residency at Johns Hopkins Medical Institutions in Baltimore. He finished his fellowship in Maternal-Fetal Medicine at University of California San Francisco in 1994. He is an Associate Clinical Professor of Obstetrics, Gynecology and Reproductive Biology at Harvard Medical School. 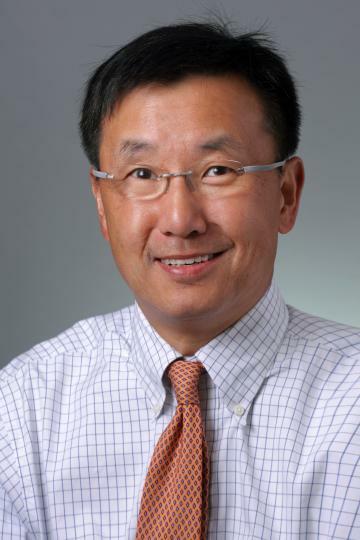 His clinical interests are preeclampsia, preterm delivery, connective tissue diseases in pregnancy, multiple gestation, hematologic diseases in pregnancy, as well as prenatal screening and diagnosis. He has four energetic boys and enjoys running, golfing and playing tennis. Lim K-H , Ecker JL, Friedman SA, Kilpatrick SJ. The clinical utility of serum uric acid measurements in hypertensive diseases of pregnancy. Am J Obstet Gynecol 1998; 178:1067-71. Rohde LH, Janatpour MJ, McMaster MT, Fisher SJ, Zhou Y, Lim K-H, French M, Hoke D, Julian J, Carlson DD. Complimentary expression of heparin/heparan sulfate interacting protein and perlacan at the human fetal-maternal interface. Biol Reprod 1998; 58 (4): 1075–83. McMaster MT, Zhou Y, Shorter S, Geraghty D, Lim K-H, Fisher SJ. HLA-G Isoforms produced by placental cytotrophoblasts and found in amniotic fluid are due to unusual glycoslylation. J Immunol 1998; 160 (12): 5922–8. Waite LL, Person EC, Zhou Y, Lim KH, Scanlan TS, Taylor RN. Placental peroxisome proliferator-activated receptor-gamma is regulated by pregnancy serum. J Clin Endocrinol Metab 2000: 85(10): 3808-3814. Hornung D, Fujii E, Lim KH, Vigne JL, McMaster MT, Taylor RN. Histocompatibility leukocyte antigen-G is not expressed by endometriosis or endometrial tissue. Fertil Steril 2001: 75(4):814-817. Maynard SE, Min J-Y, Merchan J, Lim K-H, Li J, Mondal S, Libermann TA, Morgan JP, Sellke FW, Stillman IE, Epstein FH, Sukhatme VP and Karumanchi SA. Excess placental sFLT-1 may contribute to endothelial dysfunction, hypertension and proteinuria in preeclampsia. J Clin Invest 2003;111: 649-658. Hamar BD, Levine D, Katz NL, Lim K-H. Expectant management of uterine dehiscence in the second trimester of pregnancy. Obstet Gynecol 2003 Nov 102 (5 pt2):1139-42. Levine RJ, Maynard S E, Qian C, Lim K-H, England L J, Yu K F, Schisterman E F, Thadhani R, Sachs B P, Epstein F H, Sibai BM, Sukhatme V P, and Karumanchi S A. Circulating Angiogenic Factors In Normotensive and Preeclamptic Pregnancy. NEJM 2004 Feb 12;350(7):672-83. Levine RJ, Thadhani R, Qian C, Lam C, Lim KH, Yu KF, Blink AL, Sachs BP, Epstein FH, Sibai BM, Sukhatme VP, Karumanchi SA. Urinary placental growth factor and risk of preeclampsia. JAMA 2005 Jan 5;293(1):77-85. Kazan-Tannus JF, Levine D, McKenzie C, Lim KH, Cohen B, Farrar N, Busse RF, Mulliken JB. Real-time magnetic resonance imaging aids prenatal diagnosis of isolated cleft palate. J Ultrasound Med. 2005 Nov;24(11):1533-40. Venkatesha S, Toporsian M, Lam C, Hanai J, Mammoto T, Kim YM, Bdolah Y, Lim KH, Yuan HT, Libermann TA, Stillman IE, Roberts D, D’Amore PA, Epstein FH, Sellke FW, Romero R, Sukhatme VP, Letarte M, Karumanchi SA. Soluble endoglin contributes to the pathogenesis of preeclampsia. Nat Med. 2006 Jun;12(6):642-9. Salahuddin S, Lee Y, Vadnais M, Sachs BP, Karumanchi SA, Lim KH. Diagnostic utility of soluble fms-like tyrosine kinase 1 and soluble endoglin in hypertensive diseases of pregnancy. Am J Obstet Gynecol. 2007 Jul;197(1):28.e1-6. Itzkan I, Qiu L, Fang H, Zaman MM, Vitkin E, Ghiran IC, Salahuddin S, Modell M, Andersson C, Kimerer LM, Cipolloni PB, Lim KH, Freedman SD, Bigio I, Sachs BP, Hanlon EB, Perelman LT. Confocal light absorption and scattering spectroscopic microscopy monitors organelles in live cells with no exogenous labels. Proc Natl Acad Sci U S A. 2007 Oct 30;104(44):17255-60. Bdolah Y, Lam C, Rajakumar A, Shivalingappa V, Mutter W, Sachs BP, Lim KH, Bdolah-Abram T, Epstein FH, Karumanchi, SA. Twin pregnancy and the risk of preeclampsia: bigger placenta or relative ischemia? Am J Obstet Gynecol 2008, Apr 198 (4):426. E1-6. Mark D. Modell, Takoudes T, IItzkan I, Hanlon EB, Sachs BP, and Perelman LT. Light-scattering spectroscopy differentiates fetal from adult nucleated red blood cells: may lead to noninvasive prenatal diagnosis. Optics Letters May 1, 2009 (34) No. 9: 1483-5. Young B, Levine RJ, Salahuddin S, Qian C, Lim KH, Karumanchi SA. The use of angiogenic biomarkers to differentiate non-HELLP related thrombocytopenia from HELLP syndrome. J. Mater Fetal Neonatal Med 2009, Aug 17:1-6. Steinberg G, Lee C, Rauh-Hain JA, Ecker J, Khankin EV, Hsu CD, Cohen C, Rana S, Karumanch SA, Thadhani R, Hacker, Lim KH. Early pregnancy soluble Fas levels in idiopathic small for gestational age pregnancies. Am J Obstet Gynecol 2010, Mar;202 (3): 299.e 1-7. Young B, Takoudes T, Lim KH, Rana S. Rupture of the posterior cul-de-sac during spontaneous labor. Obstet Gynecol 2010, Feb;115(2 Pt2):414-7. Kalkunte S, Boij R, Norris W, Friedman J, Lai Z, Kurtis J, Lim KH, Padbury JF, Matthiesen L, Sharma S. Sera from preeclampsia patients elicit symptoms of huyman disease in mice and provide a basis for an in vitro predictive assay. Am J Pathol. 2010 Nov;177(5):2387-98. Epub 2010 Oct 1. Kasper EM, Hess PE, Silasi M, Lim KH, Gray J, Reddy H, Gilmore L, Kasper B. A pregnant female with a large intracranial mass: Reviewing the evidence to obtain management guidelines for intracranial meningiomas during pregnancy. Surg Neurol Int. 2010 Dec 25;1:95. Silasi M, Rana S, Powe C, Cohen B, Lim KH, Zsengeller ZK, Karumanchi SA, Stillman IE. Placental expression of angiogenic factors in Trisomy 13. Am J Obstet Gynecol 2011 Jun;204(6):546 e1-4. Epub 2011 Apr 20. Bixel K, Silasi M, Zelop CM, Lim KH, Zsengeller Z, Stillman IE, Rana S. Placental origins of angiogenic dysfunction in mirror syndrome. Hypertens Pregnancy. 2012;31(2);211-7. Epub 2011 Dec 9. Vadnais MA, Rana S, Quant HS, Salahuddin S, Dodge LE, Lim KH, Karumanchi SA, Hacker MR. The impact of magnesium sulfate therapy on angiogenic factors in preeclampsia. Pregnancy Hypertension: An international Jounrnal of Women’s Cardiovascular Health. 2012 Jan 1; 2(1):16-21. Rana S, Powe CE, Salahuddin S, Verlohren S, Perschel FH, Levine RJ, Lim KH, Wenger JB, Thadani R, Karumanchi SA. Angigenic factors and the risk of adverse outcomes in women with suspected preeclampsia. Circulation 2012 Feb 21;125(7):911-9. Epub 2012 Jan18. Rana S, Hacker MR, Modest AM, Salahuddin S, Lim KH, Verlohren S, Perschel FH, Karumanchi SA. Hypertension. 2012 Aug;60(2):451-8. Epub 2012 Jul 2. McElrath TF, Lim KH, Pare E, Rich-Edwards J, Pucci D, Troisi R, Parry S. Longitudinal evaluation of predictive value for preeclampsia of circulating angiogenic factors through pregnancy. Am J Obstet Gynecol. 2012 Aug 10; Epub 2012 Aug 10. Beginning September 1, 2015, Boston Maternal Fetal Medicine will now be offering advanced genetic testing through Good Start Genetics. Boston Maternal Fetal Medicine locations are staffed with expert high-risk nurses, experienced RDMS certified sonographers, as well as top of the line ultrasound equipment. Copyright BMFM 2013. A Shelton Interactive site.